To be a Latino Christian is fundamentally to believe that the God who continues to interact with humanity will continue to do so in the future. It is a willingness to question and to challenge the “innocent” reading of the history of Los Angeles (and the U.S.), calling the country to address its corporate sins, that it can continue to grow toward a greater mañana. Los Angeles is often described as a city with no ethnic majorities. But one ethnic group predominates, though its numbers are not reflected in the civic infrastructure. In some ways Latinos* inhabit a parallel universe; they are 50 percent of the population of the city, but have relatively little political, social or economic power. Even in the religious realm usually exist at the fringe of the power structures. Yet even as Latinas are shaped by their experience in Los Angeles, they are also reshaping the city. Because of their religious commitments, Latinos are important players in the changing religious landscape too. Latino Pentecostals are influencing Protestants and even the Roman Catholic Church. The Catholic Church continues to grow because of the Latino presence, but it is struggling with the implications of that growth. 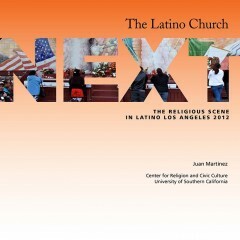 This paper will describe the religious impact of the Latina population by looking at religious and ethnic identities among Latinos, the connection between politics and religion, what Latino churches are like, the relations among the major Christian groups and how Latinos might contribute to the future of the Los Angeles. The city was founded by Spaniards and settled by their Mexican descendants. From the very beginning religion has always played an important role in the life of Latino Angelinos. 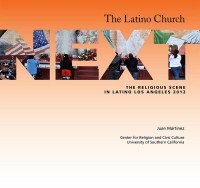 As new generations of Latinos impact Los Angeles they will change religious structures, even as they are changed by them. * Because Latino has gender in Spanish there is a need to account for the fact that the term is masculine. Of the many “solutions” proposed, I have opted for using Latina and Latino interchangeably to refer to all members of the community. Unless the context clearly refers to only one gender Latina and Latino should be taken to refer to both males and females. Juan Martinez is a contributing fellow with the USC Center for Religion and Civic Culture. Religious and ethnic identity: is there a link? Latinos and their churches. Who is in charge? A new Catholicism in Los Angeles? Where are we going in Los Angeles?